camp (small letter c) has been on my Go List for a long time. The signature curry at camp serves up a day’s recommended portion of vegetables. Most of us could probably do better at eating vegetables, so to get my daily requirement in one delicious meal makes me happy. The curry is quite smoky. 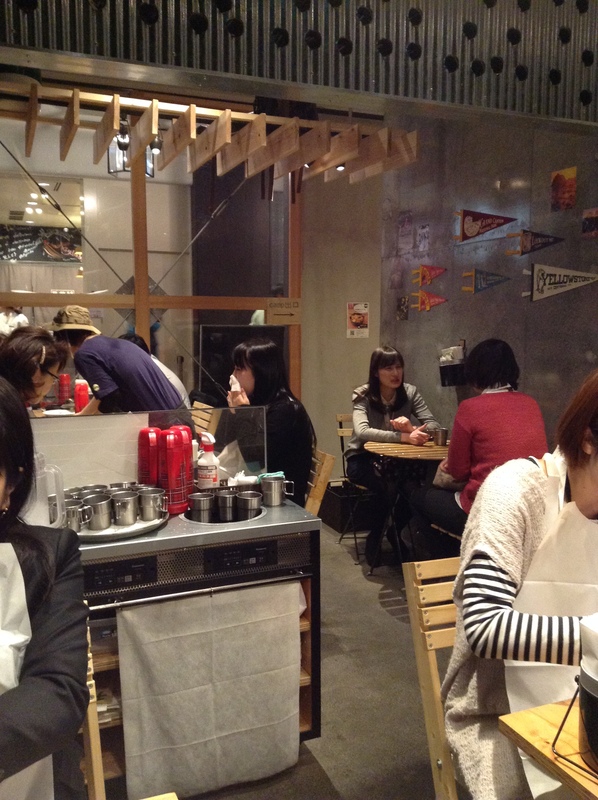 Looking into the open kitchen, it seems that each curry is made to order. There was a lot of big flames at the stove, which explains the smokiness in the dish. The mild curry includes onions, kabocha squash, cabbage and potatoes. We upgraded the dish which included some chicken wings to make it a complete dish with protein. The chicken was tough and without a lot of meat so the next time I would do vegetables only. 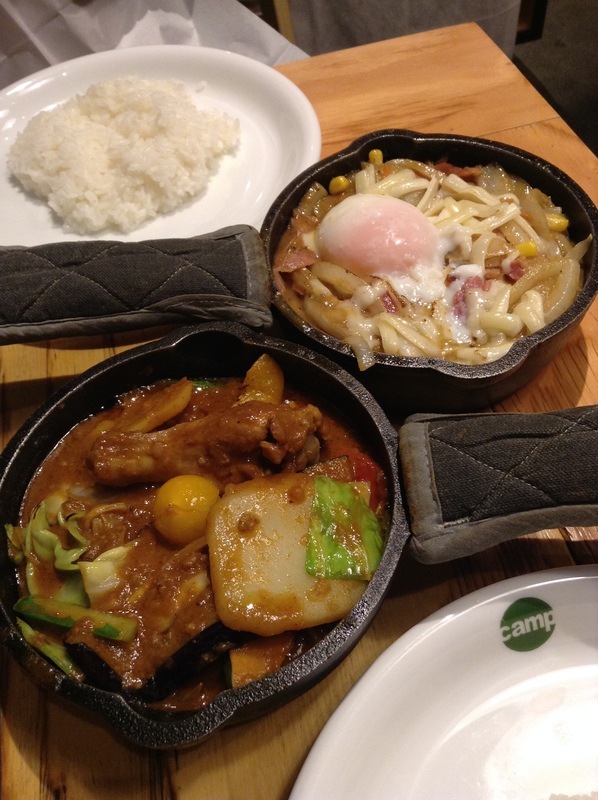 The other curry, which was very comforting, was bacon, corn, and onions that are garnished with cheese and a soft-boiled egg. Did I mention the bacon? This as well was mild, but rich with smoky bacon. Tableware is what you would take with you camping. Ice water is in a thermos on the table with silverware in a bucket. Simple interior, think wooden tables and chairs that probably came from IKEA, and the staff are in t-shirts. This shop is in a very busy business district. We came just before the lunch rush and were seated right away, but just as the noon hour came up a long line queued in front of the restaurant. There are a few branches around Tokyo including Yoyogi and camp express in Ikebukuro and Shinagawa. Went back to camp Curry at the end of summer and had another great meal. 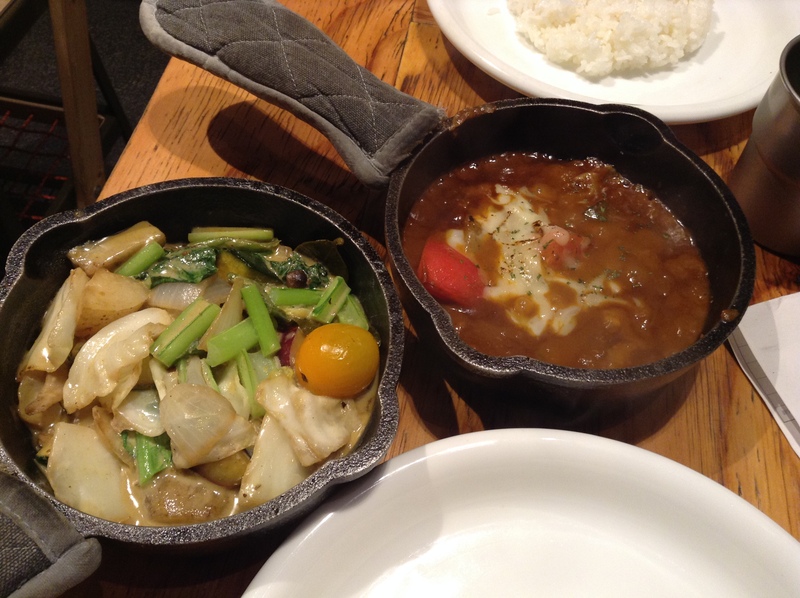 The curry on the left is one day’s vegetables in a coconut green curry and on the right is a summer tomato and eggplant curry with ground meat and cheese. It’s a great spot, just very crowded at the noon rush, so go early.